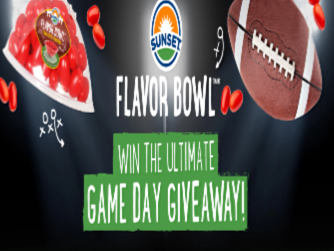 Sunset® Flavor Bowl™ Sweepstakes – Win $5,000 worth of tailgating prizes! Win $5,000 worth of tailgating prizes! ENTER SWEEPSTAKES HERE – Sunset Sweepstakes page. ELIGIBILITY – The Promotion is open only to legal residents of the fifty (50) United States, and the District of Columbia (excluding Puerto Rico, all other US territories) who are 18 years of age or older at the time of entry. SWEEPSTAKES ENTRY PERIOD – SUNSET® FLAVOR BOWL™ Sweepstakes commences at 5:00:01 PM Eastern Time (“ET”) on October 15, 2018, and ends at 5:59:59 PM ET on November 19, 2018. The Winner List will be available after November 30, 2018.